MOSCOW, the Russian Federation (BulgarianMilitary.com) – The press service of Russia’s biggest defence industry enterprises – the Almaz-Antey Air and Space Defense Corporation reported that the corporation would take part at the 12th Aero India International Aerospace Show 2019, where it would display a wide range of both military and civilian products. The biennial air show and aviation exhibition will be held in the period 20th-24th February, in Bangalore, India, learned BulgarianMilitary.com. In India, six subsidiaries of the company will demonstrate their products at the united stand that will display models and media presentations of air defence missile systems and complexes of long, medium and short range, in particular, information will be provided about the air defence missile complex Osa-AKM1, the 9F6021E Adyutant universal target training complex, and the air defence gun/missile system Tunguska-M1. Among the other products, that the visitors could see are the air defence missile complex Tor, including Tor-M2E and Tor-M2K mounted on tracked or wheeled chassis, as well as, Tor-M2KM autonomous combat modules. 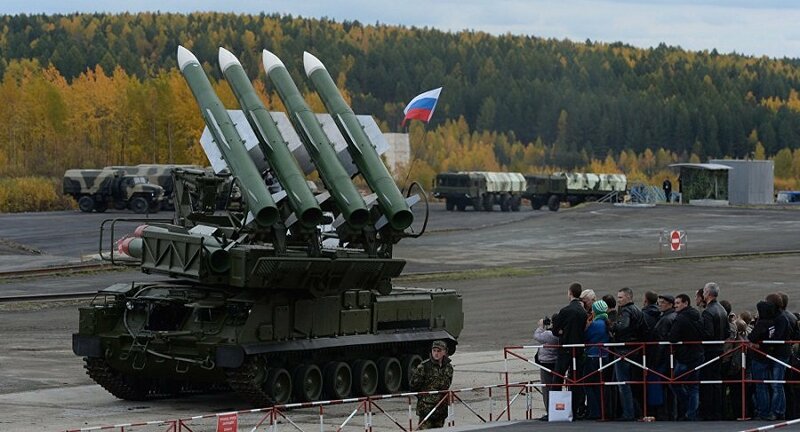 The air defence missile systems, such as the S-300PMU-2 Favorit, the Antey-2500, the S-400 Triumph and the Buk-M2E air defence missile complex also will be displayed at the exposition. Russia’s Almaz-Antey will also showcase via models and video presentations some of its air space control radars, including the mobile on-duty radar 55Zh6UME, the multi-purpose radar 55Zh6ME, the small radars 1L122-1E and RTK E-801E and the mobile radars 1L121E and 1L1215E. The statement of the press service quotes Vyacheslav Dzirkaln, the Deputy Director-General for Foreign Economic Activities at Almaz-Antey, saying that their participation in Aero India 2019 aimed at reinforcing the reputation of the company “as a reliable supplier of exclusive defence products for the Russian Armed Forces.”It is also seen as a way for the Russian corporation to find new customers among Southeast Asian countries, therefore, representatives of the corporation intend to hold a number of meetings and talks with potential buyers. Regarding the military products, Almaz-Antey has the right to be engaged in independent foreign trade activities including modernization and overhaul of previously supplied equipment, supply of spare parts and training of the personnel of its customers. In 2017, the corporation was among the world’s top ten producers of military hardware, ranked eighth among the Defense News top 100 global defence companies.